I believe that this quilt, as tiny as it is, might be my favorite quilt yet. I used Trish's tutorial here to make the blocks. I used some of my most favorite Lecien fabric as well as other prints from my stash. It is hand quilted using hand quilting cotton thread. All washed and crinkly, it is ready to hold a someday precious grandchild. To quote my little 2year old grandson, "Oh My!!" That is as adorable as they get!! Love it! It is very pretty...I pray that you are mending from your surgery...taking your time and being still while your body rests. This is so sweet! I love those little granny blocks, they make me think of little "x"s at the bottom of a letter - you know, signed with "x"s and "o"s- hugs and kisses! I love this quilt!! and the fabric is so pretty, just adorable! I really love sewing baby quilts they are so fun and I enjoy seeing the face of the Mommy who receives it. Your hand work is amazing! Oh, yes! This is so very sweet. Sweet!! Perfectly chosen fabrics and quilting for Trisha's pattern for the baby granny squares! Love it! It's really beautiful, Renee! I just love that fabric you used too! Ohhhh yes, be still MY HEART too! just lovely, Renee, great job! Eeek! This is even more wonderful than I had imagined as I have been following your progress. The emboidered bunnies are extra sweet with the quilt. A very inspiring project. Ooooh, I love this so much! When I saw this a light bulb went off in my head (and no, that doesn't hurt at all)I can make a baby quilt and actually finish it! I have been wanting to use Trish's tutorial but I still have 2 large quilts in process and I just couldn't justify starting another big quilt right now. But a baby quilt! Yes! Your little quilt is beautiful. The vintage sheet does look gorgeous with it. Just perfect - there is something about this quilt that is very special! AHH...I love this quilt! Would you mind if I used your idea for the vintage baby quilt I need to make? I smiled at the title "baby granny"! It's sometime hard for us to remember and for our grandchildren to imagine that we grannies were babies once! Oh Renee. 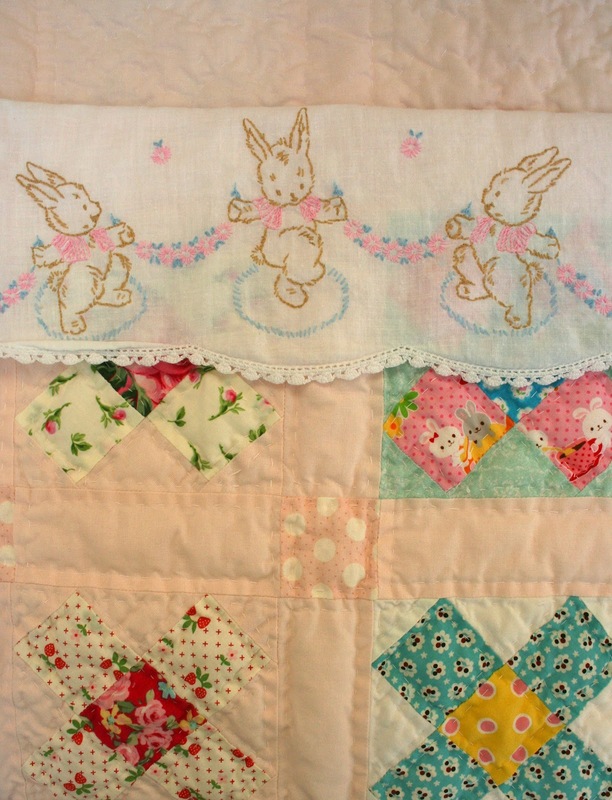 That is the sweetest baby quilt I have ever seen. Beautifully done. Adorable!!! Love seeing your work...beautiful. That Baby Granny is so cute, I can't stand it. You sure haven't let surgery hold you back. How special to have a vintage sheet and pillowcase to go with it. I have a set too, but for the life of me can't remember what's embroidered on it. Your hand quilting makes it so special. my o my o my....i LOVE this quilt!!! !